Below you will find dates for our All-Paddle Full Canyon Adventures in 2019. Click on the appropriate button below, and search by month and number of spaces you need. Join us for our 7 PM orientation meeting the evening before your Grand Canyon rafting trip begins at the designated hotel in Flagstaff, Arizona. You’ll meet your fellow rafting team, receive your dry bags, go over last-minute details and learn how to pack your dry bags and what to do with your luggage. This orientation does not cover many river life topics because there are many more orientations while on the river to explain what river life is like! Bright and early, we pick you up by bus at the designated hotel and transport you to Lee’s Ferry. Expect a scenic 2.5 hour drive with a couple of bathroom breaks. At Lee’s Ferry, you’ll unload your gear from the bus, get fitted for a personal flotation device (PFD), meet your crew and begin your All Paddle full canyon adventure! We pick you up by bus at Diamond Creek around mid-morning, and bring you back to Flagstaff. This 3 hour drive is along a creek bed, and the adventure continues on the last leg of your expedition! The buses don’t have air conditioning due to the rough drive out Diamond Creek road—be sure to continue drinking water. Our groups generally return to the designated hotel around 3-7 PM, but we cannot guarantee the exact arrival time. Upon arrival at the hotel, a staff member will be there to greet you with your luggage, room key(s) (if applicable) and the Red River Sports store. We recommend you stay in Flagstaff that evening in case of any travel delays and to attend the post-trip dinner (most of our groups partake in this final hoorah!). 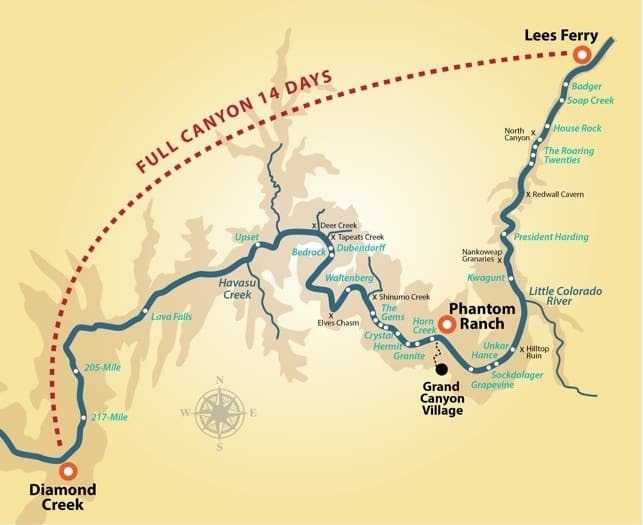 There are many options for getting to and from your All Paddle Full Canyon Grand Canyon rafting adventure. See below for some tips on how to start planning your transportation details. We recommend flying into Phoenix Sky Harbor Airport or Flagstaff Pulliam Airport in Arizona. Las Vegas is not as convenient as you might think because of the lack of shuttle options and the inconvenient shuttle times. If you fly into Phoenix, you can either rent a car to get to Flagstaff or book a shuttle through Arizona Shuttle. We recommend that you investigate your shuttle transportation options prior to securing your flight. Flagstaff is located approximately 2.5 hours north of Phoenix, at the junction of Interstate 40 and Interstate 17. You may arrange to pick up or drop off a rental car at the Flagstaff Airport. You may leave your vehicle parked at the designated meeting hotel for the duration of your trip free of charge (it is not a secured lot). Arizona Shuttle offers multiple daily shuttles between Phoenix Sky Harbor Airport and Flagstaff. The shuttle takes approximately 3 hours and requires reservations. A Friendly Cab also provides shuttle services in Central and Northern Arizona. Flag Shuttle provides customized shuttle times and offers multiple shuttle options in Central and Northern Arizona. A Friendly Cab (928-774-4444), Sun Taxi and Tours (928-774-7400), Apex Taxi (928-779-0000) and Uber all offer taxi services in Northern Arizona. To find the most accurate packing list for your specific adventure, access your online trip portfolio, and under the section reading “View Info & Documents”, you’ll find the “Equipment and Pack List” document. You’ll have access to this upon reserving your adventure. We have prepared packing lists for different times of the season depending on the average temperature that time of year, so they’re accurate to what you’ll need to bring on your adventure specifically. If you have any difficulties finding this document, call our office and we’ll be happy to assist you! If you are currently in the planning process for your adventure and would like to see an example equipment list, contact our office by phone or email, and we’ll send you one right away. Your white day bag is used to hold all of your gear that you’ll want to access to during the day. Think of this as your carry-on luggage. It is approximately 24” tall and 18” wide. Your blue bag holds all of the rest of the gear that you don’t need during the day. This is like your checked luggage. It is approximately 22” tall and 14” in diameter when packed. Your sleep kit bag is also blue and contains your sleeping bag, a sleeping bag liner and a ground tarp. You will receive this bag on the river. Tent: one per every two guests on a reservation. Separate tents can be requested. Groovette: quart-sized paint cup to be used when urinating in the river or camp toilet is not ideal. If you are the physically active type who wants to participate in the most active Grand Canyon rafting adventure, who wishes to be a part of a team maneuvering your raft down river, who likes to push your boundaries and live a little more on the edge, then the All Paddle full canyon adventure is the trip for you! This is the choice trip for the most active adventurers who are looking for the ultimate Grand Canyon whitewater adventure. Most of our All-Paddle guests have already done quite a bit of paddling or kayaking on other rivers and join us on this trip with prior knowledge of the strenuous nature of being in a paddle raft 100% of the time while on the river. However, we welcome new paddlers on our adventures as well! The Colorado River through Grand Canyon is 90% flat water, so although it is an exciting whitewater experience, it is also strenuous during the flat water, as it can be windy, rainy, hot and tiring. We often get asked what the best time of year to raft the Grand Canyon is, and our answer is always “it depends on what type of weather you prefer!” You’re going to get different weather every month. Some months are more variable weather-wise, whereas others are more reliable. Below is a general guideline as to what type of weather to expect each month on your Grand Canyon rafting trip. Our All-Paddle Adventures are scheduled in May, June, July and August. May: Average high is mid-80s to the mid-90s, with lows in the mid-60s. This is a variable month, and can be cold and possibly rainy if we’re experiencing a long spring, or it can be warm and dry if we’re having an early summer. June: Average high is 100-115 degrees F, with lows ranging from mid-70s to mid-80s. This is, on average, the hottest and driest month in the Canyon. Rain is possible toward the end of the month. July: Average high is 100-115, with lows ranging from mid-70s to mid-80s. This is our monsoon season in Grand Canyon. Rain is expected and offers a reprieve from the heat. August: Average high ranges from upper-90s to 110, with lows ranging from mid-70s to mid-80s. Our monsoon season extends into August. Rain is expected. Unexpected situations arise every year that cause our rafting participants to cancel. Because our deposits and final payments are non-refundable (after payment due dates pass), we highly recommend trip cancellation insurance. Although spaces are transferrable to another person, they are not transferrable to future years. Those who don’t purchase trip cancellation and cannot find anyone to refill their space(s) will lose their money. We provide you information for Travelex, but there are many other choices available, such as TravelGuard, USAA or Alliance. These policies also include evacuation and medical insurance should the need arise. It is an additional cost on top of your rafting adventure, but we have found that it is worth the price! It’s best to start investigating trip cancellation insurance plans at the same time you put down your deposit. This will cover you for any pre-existing conditions you may have or protect you before something happens that may prevent you from going on your trip. We are not qualified or authorized to answer technical questions about the benefits, exclusions or conditions of any of the insurance offered, or evaluate the adequacy of the prospective insured’s existing insurance coverage. Please direct specific questions to the Travelex customer service department. Would I recommend AZRA? Absolutely and I can say no ``paid adventure holiday`` has come close to the perfection of organisational skill, personnel and personal attention, education, fun and community. It was truly the adventure of a lifetime and we still wish we were riding a rapid or pulling in to shore for the evenings camp as BJ calls out ``dinners nearly ready``...Matt, BJ, Margaux, Claire, Doty and Wesley- thanks to you all, you did us proud.